Imagine a skyline of sky-scraping mountain peaks! New York City marks the site where continents collided, fused, and rifted apart over a period of a billion years. 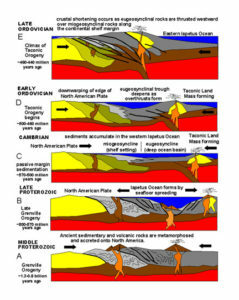 New York City is the site of ancient earth-shaking events. 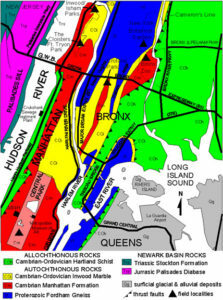 The bedrock that anchors Manhattan’s skyscrapers was formed between 450 million and over a billion years ago. Manhattan is built on three strata known as Manhattan Schist, Inwood Marble, and Fordham Gneiss. Schist forms the island’s spine from the Henry Hudson Bridge on its north end to the Battery on its southern tip; it dips abruptly several hundred feet below ground at Washington Square, and makes a gradual ascent beginning at Chambers Street. These dips and rises account for the gap between “Midtown” and “Downtown” in the Manhattan skyline, since tall buildings had to be anchored on solid bedrock and not on the glacial till that fills the valleys. 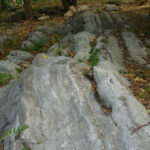 The schist, a metamorphic rock, was formed around 450 million years ago during what is known as the Taconic Orogeny, when mountains were thrust into the sky and the continents collided, an earth-shaking event that led to the creation of the supercontinent Pangaea around 300 million years ago. Inwood Marble, which is metamorphosed limestone, was formed around the same time as the Manhattan Schist. The 150 to 500-foot-thick marble beds lie beneath the Harlem River and adjacent regions known to geologists as Inwood Lowland, the East River and the Harlem Lowland; they erupt above ground as a ridge that extends from Dyckman Street on the Upper West Side northward to Marble Hill. 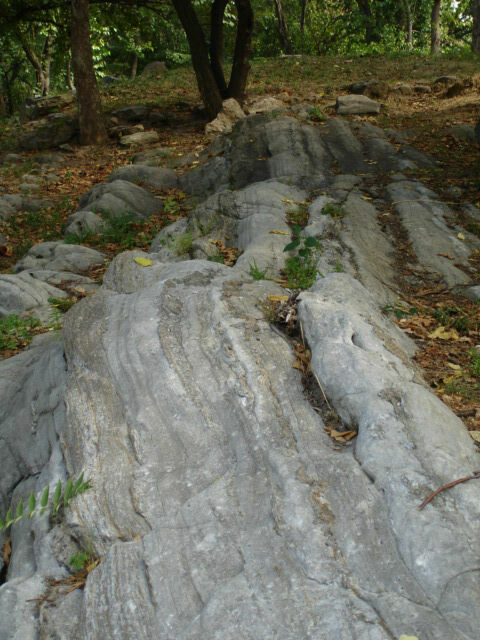 The billion-year-old Fordham Gneiss was formed during another ancient mountain-building episode, the Grenville Orogeny, when continents fused into an ancient super-continent. 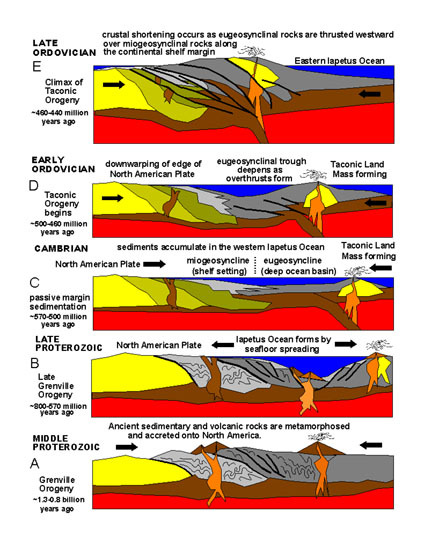 During the Taconic Orogeny, the granite bedrock was overthrust and interlayered with the schist and marble strata, forming the so-called Manhattan Prong. It forms the Riverdale and Grand Concourse ridges in the Bronx. These three strata shape the topography of Manhattan. They are by no means arranged in simple layers like the leaves of a book but are complexly interfolded. Together they tell the story of a place that evolved through eons of time. 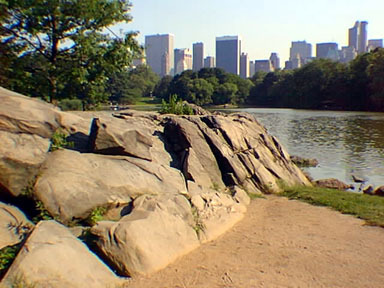 Central Park and Inwood Hill Park are two of the best places to see outcrops of Manhattan Schist. Central Park is, of course, in the center of Manhattan. Download a map of the park from the Central Park Conservancy (centralparknyc.org), and if you’re more scientifically inclined, take a look at the geological tour maps of this park and others on Manhattan provided by Charles and Mickey Merguerian of Hofstra University on their wonderful geology website (see below). 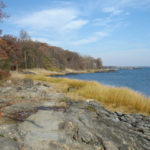 Two of the most famous of the outcrops are Umpire Rock, aptly named because it overlooks the Heckscher Ballfields in the southwest area of the park; and The Platform in the park’s southeast side (east of the Dene, north of the Playground around 68th Street). You can see other exposures of schist just west of the Carousel and around The Pond in the park’s southeast corner. On the park’s west side around 72d Street, The Lake offers good exposures. Take a close look at the outcrop surfaces for the scratches, striations, and grooves left by the last glacier. Besides schist outcrops you’ll notice many glacial erratics, rocks transported from elsewhere by glaciers. 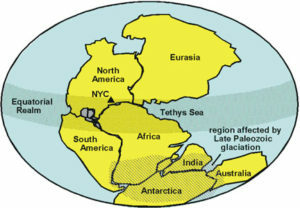 See my Ice Age page to learn more about this last geological event in the NYC region. Inwood Hill Park is on the northern tip of Manhattan (bordered by Dyckman and Payson streets on its south and east sides, the Hudson River on its west side, and the Harlem Ship Canal on its north). 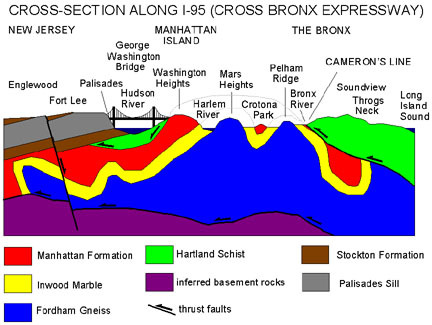 Here you can observe the three bedrock strata in the landforms: Manhattan Schist underlies the ridge of Inwood Hill; Inwood Marble underlies the Harlem River; and Granite Gneiss surfaces as the Riverdale Ridge across the Harlem Ship Canal. 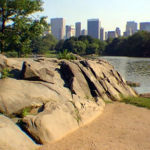 The Manhattan Schist outcrops in Inwood Hill Park reveal glacial striations made by the scraping of a glacier over the rock tens of thousands of years ago. At the westernmost end of the park, where the trail climbs the ridge to an overlook above the Hudson, you can see the vertical blocky cliffs of the New Jersey Palisades rising over the river, a mafic rock formation created during the rifting of Pangaea around 200 million years ago. So you are in effect looking across a huge span of time: standing on a metamorphic rock formation dating back 450 million years to the collision of continents and looking at a sedimentary and igneous rock formation dating back to the breaking up of Pangaea! Across the street from Inwood Hill Park is Isham Park, the pocket park on Isham Street at the corner of Seaman Avenue. Here you can see beautiful outcrops of Inwood Marble. 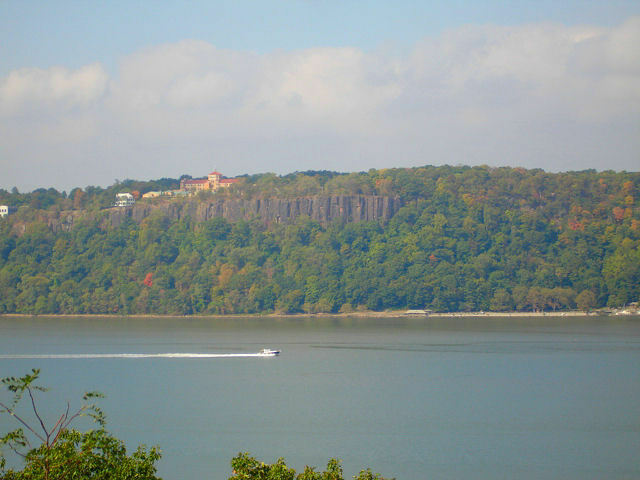 For an even greater time span than the overlook at Inwood Hill Park, you can visit Wave Hill, a lovely garden and preserve in the Riverdale section of the Bronx, overlooking the Hudson River. 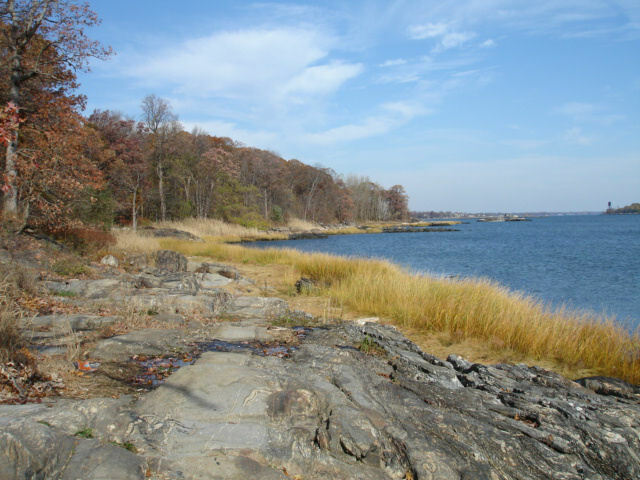 At their overlook, you can look across the river to the 200-million-year-old Palisades while standing on a ridge of billion-year-old Fordham Gneiss! 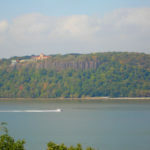 The Palisades along the Hudson offer a dramatic window into the rifting of Pangaea, when continents broke apart at the seams beginning some 200 million years ago. Lava erupted through rift valleys and intruded into sandstone layers. When the lava cooled, it formed beds of dolerite enclosed in layers of sandstone. As the rift valley subsided, the sandstone and dolerite layers were tilted and exposed; over time the red sandstone envelope eroded away, leaving the dramatic black vertical blocks of the Palisades.